Today's blog post was first written on a scrap piece of paper while riding the subway home from work. As I was scribbling down my thoughts, I noticed the person sitting next to me was busy tapping away on a tablet device. In fact, so was the person across from me. My pen and paper suddenly feels isolating. The recipe I'm sharing with you today is very special to me, because of scribblings on a piece of paper. It is the only recipe my mother has ever written down and passed to me. It was her friend's recipe, who first made it for our family over ten years ago, and we loved it. My mother wrote down the instructions in English on a piece of computer paper ripped in half, shortly after her friend recited it to her in Cantonese. I then took that recipe and wrote it down into my little recipe notebook, which kept no more than a dozen recipes that I had tried only once or twice. That notebook was a well-intentioned project to document some of my favourite recipes, which now, a decade later, I have decided to re-instate with the purpose of publishing an heirloom recipe collection for my own daughter. The only recipe from that old notebook that will live on through the generations is this one. 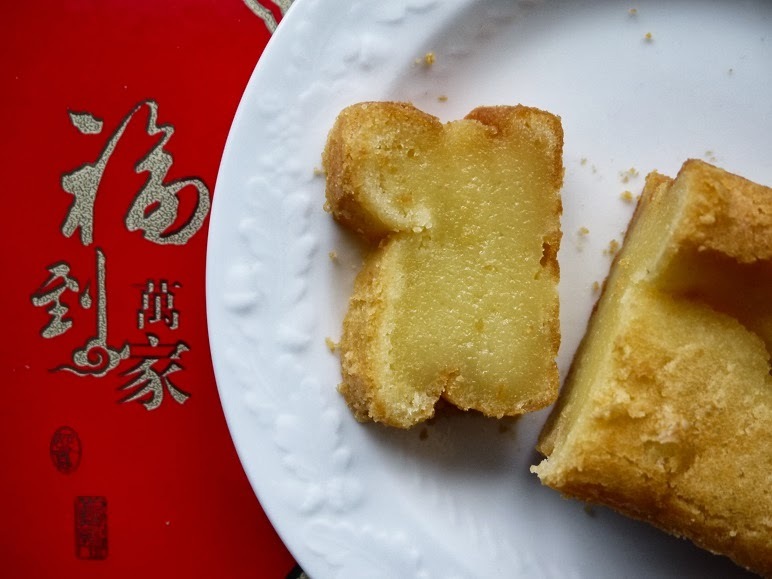 This is a recipe for a sweet Chinese New Year cake. It's not the traditional steamed cake with the red date on top, but a richer, baked cake that deserves to be made more often than just once a year. Although it is a new year cake, it's not a celebration cake as we would normally think of it. No candles are lit, no song is sung. Instead, it's a subtle cake with a memorable character that is shared with your guests, or brought into a home to be shared. 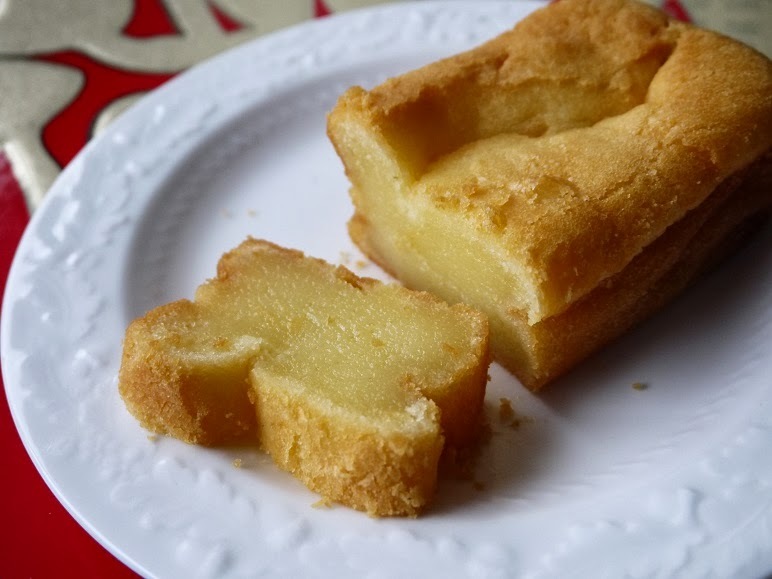 The glutinous rice flour gives a soft, chewy texture similar to mochi, but the baking process browns the edges to a firm, toothsome crumb. It's lightly sweetened, enriched with eggs, perfectly scented with coconut milk, and has all the makings of a new annual tradition in my family. This recipe calls for 1 cup of coconut milk, which is just over half a can (400 mL). Unfortunately, coconut milk doesn't keep well in the fridge once the can is opened; I find it is questionable after 2 days, unusable after 3 days. The good news is that coconut milk freezes nicely. Freeze the unused portion of the can right after you open it, unless you're planning to use it the next day or so. Defrost frozen coconut milk in the fridge for 12-24 hours, and stir it well before adding it to the recipe. Arrange one oven rack on the top third of the oven, and a second rack on the bottom third. Skip this step if making 4 mini loaves, as all 4 pans will likely fit on one middle rack. Preheat oven to 350°F. Generously grease pans with unsalted butter. In a medium bowl, mix together coconut milk, milk, sugar, and vegetable oil until well-blended, and set aside. In a large bowl, combine rice flour, baking powder and salt. Pour in the milk mixture, and stir well. Add one egg at a time, stirring in between, until the batter is smooth. Divide the batter into the prepared pans, being careful not to fill right to the top to allow for rising. The batter will puff up quite a bit while rising in the oven, but does stay relatively firm and likely won't overflow if you've left a little room. Place one pan on the upper rack, and the other pan on the lower rack. If making mini loaves, place all 4 pans on middle rack. Bake for 30-35 minutes for muffin-sized cakes or mini loaves, or 35-40 minutes for 8" square cakes or 9" round cakes, switching pan positions and giving each pan a turn halfway through cooking time. The cakes are done when a cake tester inserted into the middle of a cake comes out clean, and the tops are a lovely golden brown colour. Remove from oven and cool in pan for 30 minutes on a cooling rack. Carefully remove cakes from pans, cooling completely on rack. Store in an airtight container at room temperature for up to 3 days. love it! especially in a loaf pan.